The gardens that Nebuchadnezzar made for his wife have been accounted in many lists as one of the seven wonders of the world. The other part of ancient Bablyon that made it on the list were its incredible walls. The ancient ruins of this famous city lie about 50 miles to the south west of Bagdad in Iraq. 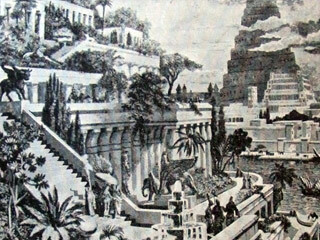 The hanging gardens of Babylon were a present to Nebuchadnezzar's wife that contained exotic plants and animals which were imported from all over the world. Babylon during the reign of King Nebuchadnezzar had conquered and controlled virtually all of the then known world and he made use of these conquests in furnishing his garden with decor which made it become one of the seven wonders of the world. "The Hanging Garden has plants cultivated above ground level, and the roots of the trees are embedded in an upper terrace rather than in the earth. The whole mass is supported on stone columns... Streams of water emerging from elevated sources flow down sloping channels... These waters irrigate the whole garden saturating the roots of plants and keeping the whole area moist. Hence the grass is permanently green and the leaves of trees grow firmly attached to supple branches... This is a work of art of royal luxury and its most striking feature is that the labor of cultivation is suspended above the heads of the spectators." Learn about the most important wonders of our day! • The gardens were listed as one of the seven wonders of the ancient world. • King Nebuchadnezzar made the gardens for his wife. • The city of Babylon is a subject of Bible Prophecy. • Bible Prophecies about Babylon have been fulfilled very recently. • Babylon is located about 50 miles to the south west of Baghdad in modern day Iraq. A New Search Engine is Coming Soon!